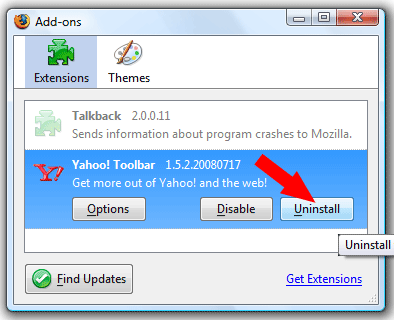 In the following simple solution, I’ll show you how to remove the Yahoo Toolbar from Firefox. The Yahoo Toolbar is often unknowingly installed with other software packages. There is nothing wrong with the Yahoo Toolbar, but if you don’t use the tools that are offered, you might consider it to be taking up precous space in your browser. Restart Firefox and your Yahoo Toolbar should be gone!